While New York City mourns, political opportunists point fingers—but we should really be talking about reforms that would keep everyone safe. 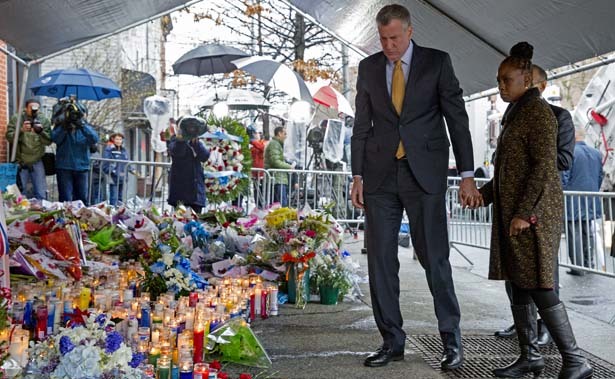 Mayor Bill de Blasio and his wife, Chirlane McCray, visit a memorial to two police officers murdered in Brooklyn (AP Photo/Craig Ruttle). Police-union leaders and their allies, however, chose this moment to talk not of peace but war. “The mayors hands are literally dripping with our blood because of his words actions and policies and we have, for the first time in a number of years, become a ‘wartime’ police department. We will act accordingly,” declared a now-infamous memo attributed to the Patrolmen’s Benevolent Association. The PBA disavowed the memo, but its president, Patrick Lynch, clearly relished its imagery, speaking of “blood on the hands” repeatedly to reporters. Joining this twisted chorus were, among others, former NYPD commissioner Ray Kelly and former governor George Pataki, who called the killings “a predictable outcome of divisive anti-cop rhetoric” of Eric Holder and Bill de Blasio. Where to begin? If anyone’s words could have a dangerous “predictable outcome,” they are those of Lynch, Pataki, Kelly and others, whose inflammatory statements contradict the message they otherwise seek to send: that the police are not the enemy but serve to protect the public. Of course, this is not how New Yorkers of color have experienced policing in the era of stop-and-frisk, which Mayor de Blasio pledged to end. Indeed, Lynch may have provided a service of sorts in so clearly articulating the occupying-force mentality that the protesters have been denouncing all along. Outrageous as it is to blame democratic protests for the singular act of a mentally ill individual, it’s also true that highly charged political debates sometimes attract unstable, paranoid and untreated minds. But Brinsley has more in common with Sydney hostage-taker Man Haron Monis, or schizophrenic abortion-clinic shooter John Salvi in 1994, than he does with peaceful protesters against police violence. If anything, this tragedy is a reminder of why the underlying issues in this debate are so urgent—why good policing is tied to gun control and a better mental-health safety net; and why a new contract between police and communities is necessary. For the protest movement, it’s both good policy and good politics right now to focus on specific demands: abandon “broken windows” policing, abolish arrest quotas and push for independent prosecutors when abuses occur. Those are reforms that will help keep everyone safe.